The photo is from last weekends major display. 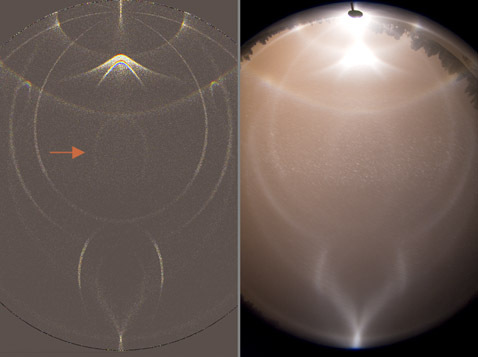 The arrow in the accompanying simulation (Jukka Ruoskanen's program) points to a halo that arises from Parry crystals with raypath 4-8-1 (where 3 is upper face). This arc was found from photos previous winter ( 1 ). Simulations showed then that triangular Parry crystals made it. Same applies to this new case: Parry halos in the display were simulated successfully only with triangular crystals. the new day — the new halo! Wow very nice! The 4-8-1 arc looks better and the tape arcs are nice. I noticed the subanthelic arc just like in the simulations I do with halosim it shows the intensity variations. Yeah, this case is much better than year ago. No need to usm much at all. Notice that there is no upper suncave Parry. This is one telltale of triangles falling with the edge pointing straight up.